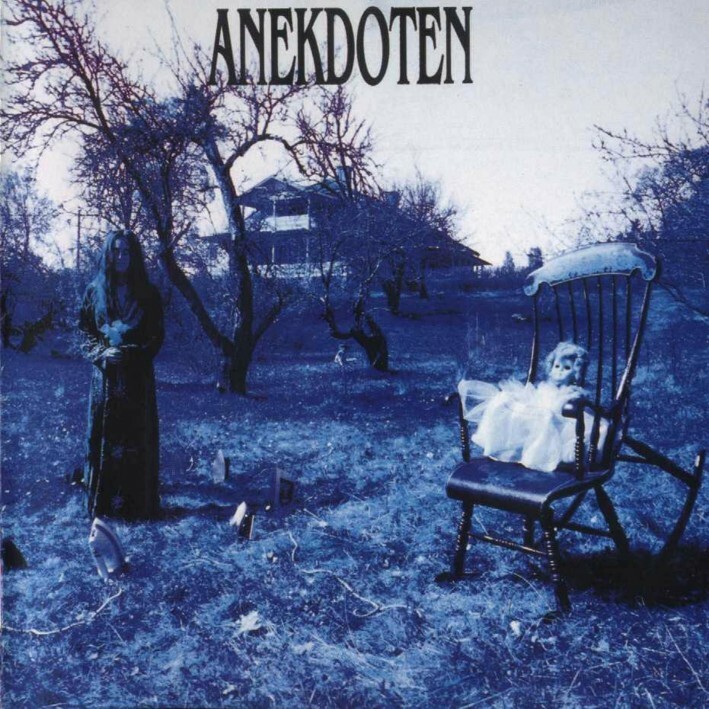 Anekdoten is a new four piece from Sweden. This album was recorded early this year, and from what I've heard, they have been highly revered by, among others, their countrymen Änglagård. What do they sound like? Well, in one word, heavy. When I started in on the third track I thought I was listening to Ruins! They are also quite dark, not unlike Änglagård, or Kultivator, or even Balleto di Bronzo. Perhaps the sound they evoke the most though is that of mid-period King Crimson, especially Red and some of those wild improvs on The Great Deciever. The instrumentation is, if I recall correctly, guitar / Mellotron / vocals, cello / Mellotron / vocals, bass, and drums. This accounts for a lot of the Crimson similarities, but beyond that the harmonies and melodic intervals they use recall KC, as well as Änglagård and maybe even a little French zeuhl. They have a heavy bass sound, and the guitarist does often sound like Fripp, both in tone and style, even going so far as to cop a few Fripp licks in his solos. Two of the songs depart from the "heavy" sound for a welcome respite of mellow acoustic meanderings, featuring plently of Mellotron. Speaking of Mellotrons, they are usually heard equipped with tapes of strings, choir, and occassionally flutes and brass. Anekdoten go even further with tapes of double reeds, clarinets, and maybe even some others I haven't picked up on yet. There are some nice passages where the two Mellotrons are set up with different tapes, and the layering of the sounds, such as strings and double reeds, is a trick one doesn't often hear. The album consists of seven tracks, mostly in the 7-8 minute range. There are two instrumentals, and the rest have vocals, in English, which fit quite well with the mood of the music. The sound is rather "produced," so there is no mistaking this for a long lost mid-70s album. Overall this is a good CD; not spectacular, but there is enough here to make this a "grows-on-you" kind of album. The musicianship is solid, yet there are no flashy solos or technical tours-de-force that might begin to push this towards the prog metal realm. My biggest criticism would be a slight lack of maturity in the writing. If they improve on that in the future, Anekdoten could really be something. As it is, this is a good debut album (though a step or two below Änglagård), and if you're not afraid of heavy prog you would do well to give this a listen.